You are currently browsing the category archive for the ‘quilt classes’ category. 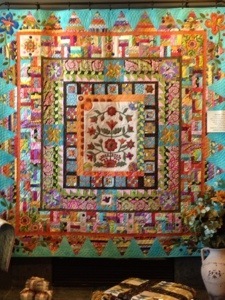 We had such a great time getting together this past weekend to teach the Patchwork Glamper. Spending the day before Mother’s Day sewing, chatting and crafting. What more could a mom want to start the weekend off. 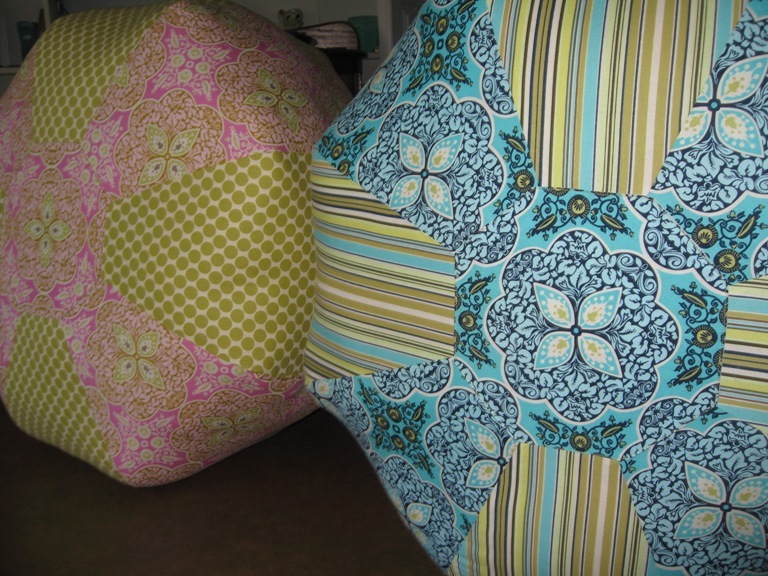 The Patchwork Glamper is a fun way to incorporate all those trims, buttons and embellishments you’ve been stashing and a great way to learn many skills like English Paper Piecing (EPP) hexagons and embroidery with low commitment. It’s so fun to see how each persons creativity shines through when we hold workshops or customers send us pics of items they’ve made with our patterns. This design is so flexible and forgiving. Each of the girls work was unique. For example…A few of the girls decided to leave out their center hexie and let the flower be the focus and the background fabric shine through. Or design your own camper to add to the work. Ann wanted her camper to be similar to the one she travels in so she designed her very own and added a little bling. Or how about how Wendy decided she’d rather have a pillow and tweaked hers to be more square. Check out her cute puppy button in her center hexie! Jalana had a great idea to repurpose the burlap from a bouquet she received. 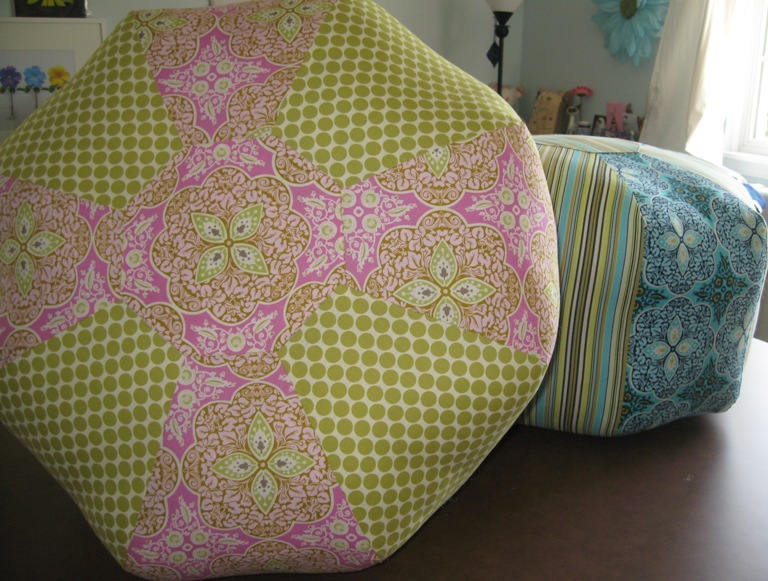 And check out all the details she added to glamp up her work…her wheel is a adorable! Jen’s Glamper is so bright and cheery! Her first time at hand sewing hexies and embroidery work. Great job Jen! Ann finished and framed her Glamper. I think I’m now partial to the tilted letter. It gives it a whimsy feel. The workshop was so relaxed that us teachers even got in on the action. Paige used her time to refresh her hand sewing skills. And I finished up my sample while I showed the girls the techniques. Thanks everyone for participating. We had a great time! 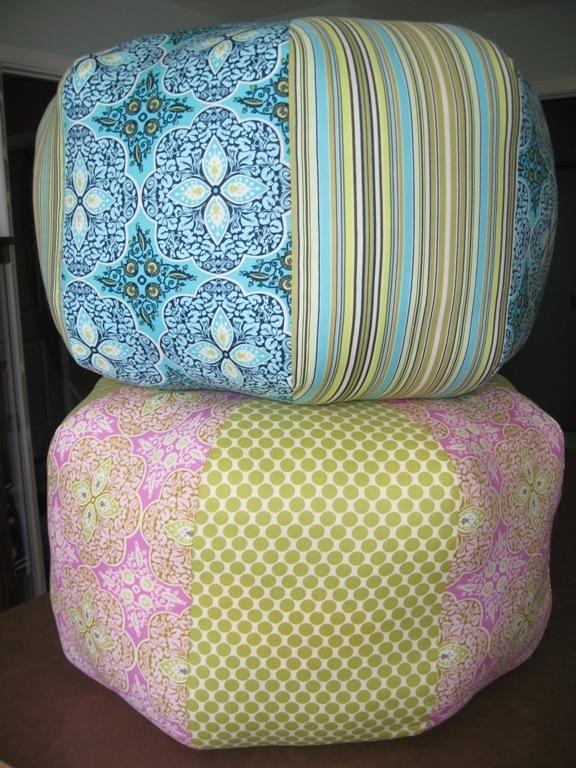 Contact me if you’d like SewMod to come teach a Patchwork Glamper class. You can find all of our workshop info here. Well…Shelley and I are taking a border challenge class together at one of our local quilt shops, Acorn Quilts.. All we needed to start was to bring a center block of our choice. Of course being the over achievers we are, it had to be something fabulous! I chose the Which Witch’s Boot that I had been embroidering for Paige. I’m almost finished with the center. I’ve been stuck on the circle stitch, actually just dreading doing that stitch, so final decision…I’m not doing that stitch! 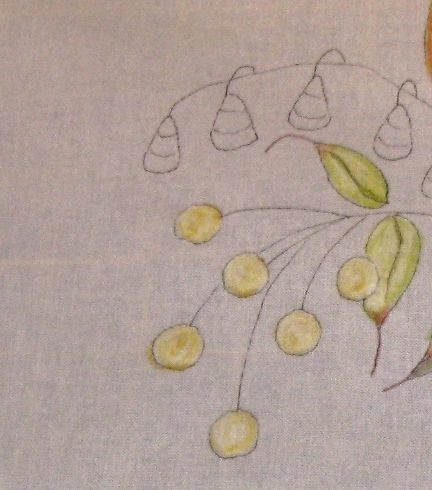 I’m going to add little yellow wool circles to it instead, giving it even more dimension. Since I’m almost finished, I’m going to hold off showing the finished piece till next time. The quilt hanging in the shop was truly a work of art with attention to detail. And I loved the blue border on it. The idea of the class is to start with a center and show up each month for the next border idea, 5 total. Our first class was yesterday evening. After everyone showed off their center, a color was chosen from a crayon box at random and a page number from a quilt block book. Our first border idea must incorporate the color Sepia, (a shade of brown) and flying geese. It doesn’t matter if it’s a tiny piece of brown or even just one flying geese as long as you can show that was added to the border in some way. 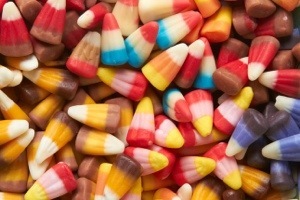 The first thing that comes to mind when I think of flying geese and Halloween is Candy Corn! Pretty excited about that! I hope I can get that to work out. Next month when we meet there will be a new set of colors/tasks to work with. Each time the fun changes, and so does the inspiration. 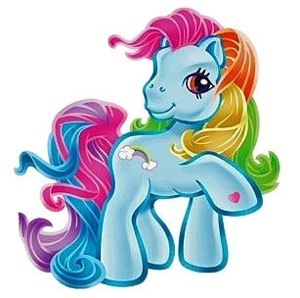 For example, we asked what was the inspiration for the blue triangle border on the sample quilt and she replied that she had chosen a “My Little Pony” from a basket of “items” and the pony had pointed ears shaped like triangles. I’m sure y’all noticed our new logo that Paige added not too long ago to the blog and Etsy. We have a talented graphic designer. We asked her to design something modern/whimsy, with daisies, in a blue/green combo. It’s exactly what we had in mind. We had some note cards and business cards made up too. We couldn’t be happier with it Holly. Thank you! In exchange for her work, she asked if we could make her a couple of gumdrops for her children. We made the large gumdrops and used Amy Butler’s Daisy Chain in pink and turquoise. Wanna make your own gumdrops? We’re holding a gumdrop class if you live in the Chicagoland area. All you need is basic sewing skills. Click on the Contact us and drop us an email if you’re interested. You will be addicted to gumdrops too! Paige is also giving private machine quilting lessons, one on one, for anyone interested in learning machine quilting. The class can be tailored to your experience level, so that you will feel confident in your machine quilting.